It’s actually not all bad. Ask some of the teens I work with to list the up sides of anger and they will look at you with a puzzled expression as though you are crazy to even suggest that such benefits exist. The only benefit that they sometimes come up with is “when I rage, it’s a release”. That release then creates the problems though. When I get angry, I go into this weird internal dialogue as I battle with myself to suppress it, hide it, fight it, pretend it’s not there, and turn the blame toward myself. Anger produces guilt as though being angry = I am a bad person. Why? 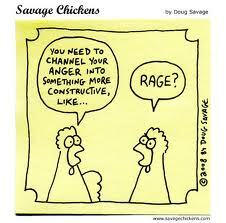 because I am one who struggles with fully embracing the up sides of anger – the messages that anger often gives. I even find myself apologizing for my anger, before I have even expressed that anger is in fact what I am feeling. Problem is, the truth always comes out. It’s bizarre and yet, I see that pattern in a lot of different people. Maybe raging is healthier? The ragers wouldn’t say so. What is healthy and constructive? Messages that the actual emotion of anger communicates to us include: our boundaries have been crossed, we are giving more than we are comfortable giving, our needs are not being met, our emotional safety has been compromised, we are not communicating a truth about something, someone is cramping our growth, and we are avoiding dealing with an important issue in our lives. So… a healthy expression of anger is as simple as being in tune with the message that those intense rage feelings are communicating, listening to it, and doing something about it to honor what you are actually experiencing and the impact it’s having on your well-being? Right – so simple. We first need to develop the skill of being really honest with ourselves and in tune with our bodies – Not so simple. Gabor Mate, M.D. and author, shared his perspective at a lecture I attended. He talked about how one of three things often occurs. 1) A healthy experience and expression of anger would involve a situation where a person is angry if and only when an actual threat is present (threat being one of the messages listed above). When the threat is gone, as a result of having done something about honouring our needs, the emotion itself dissipates as well. 2) The problem is, we all have baggage. Some more than others perceive a threat and get angry about it when it’s not actually there. For example, assuming someone is taking advantage of us when they aren’t. Or, jumping to conclusions based on projecting our past history onto current circumstances. In cases like these, the work that is to be done involves sorting through that baggage, letting go of past hurts, checking in with reality, and changing our patterns of response whenever that perception of threat starts to emerge. 3) Resentment – When we make ourselves sick by hanging on to the emotion of anger long after the threat has been removed. We resent, punish, hold grudges, and poison ourselves only to gain this sense of righteousness about how we’ve been wronged. Conclusion: The healthiest form of anger is only experienced in the actual presence of a real emotional threat. The threat is gone – so is the anger. In any kind of mindfulness-based approach to emotional regulation, the task at hand involves simply allowing the emotion of anger to just be there without reacting to it or acting on the thoughts that surface; to just experience the bodily sensations fully and completely to become aware of the message it’s communicating. Then, taking appropriate actions to change the situation. Eventually, the anger dissipates. It can’t last on its own. Nothing ever does. The experience only persists when we get attached to the mental cognition – the story – that the bodily sensations represent and ignore what that emotional experience is actually trying to communicate. As long as no one says “just calm down!”.